When trying to come up with the first installment, I toyed with a lot of different ideas. But then I was like, "'Hel-LO, Megan! '— Miss Martian loves to cook too! Let's do a tribute to her!" Miss Martian (real name, M'gann M'orzz) is a DC comics character who the niece of Martian Manhunter. In the cartoon, Young Justice she is coming to Earth for the first time and very much wants to fit in—but all her ideas about Earth girls come from TV, so she is a little naive. She tries out for cheerleading, she always wears skirts, and she bakes her little heart out. Despite that, she works very hard, she's very powerful, and she tends to be the one that pulls her team of heroes back together when they are squabbling. 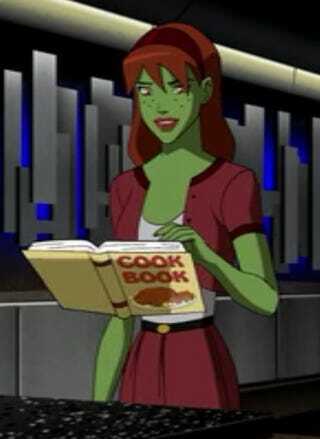 In one of the very first episodes, we get to see M'gann try her hand at baking cookies. Hopefully I'll be more successful at it than she was. Zest your lemon by grating the peeling with a fine grater or a zester. Set this aside. Whip the cream in a small bowl until it becomes the consistency of sour cream; this is so the mix doesn't come out too runny. Combine sugar, cream and vanilla, then butter and lemon zest. Mix this on low with a mixer, or you can use a spoon to smush it all together. Mix it until it's nice and creamy (personally, I used my hands). Sift the flour in a separate bowl and then stir in the baking powder, salt and Kool-Aid. Don't stir it too much or you'll defeat the point of sifting it. Best practice is to do this with a fork or whisk that aerates as you stir. Pour the dry ingredients into the wet and mix until consistent (low speed on a mixer if you have one). Again, I used my hands. This is the point at which you will start to see the color developing in the cookies. Lastly, fold in the pecans until they are distributed. Wrap the mixture in plastic and chill it for 30 min; this will make it easier to cut/drop onto your pan later. After 30 mins, roll the mixture into balls, around 1 inch diameter (should make about 24 balls). If you want, you could also roll it out and use a cookie cutter. Place the cookies on an ungreased cookie sheet and bake them for 15-18 minutes. They don't have eggs in them, so if you undercook them a little it's okay. You want the edges and the bottom to be barely golden brown. When you take the cookie sheet out of the oven, it will continue cooking the cookies unless you scoop them up and rack them right away. When they cool, it will also help them become more solid. Be aware that these are shortbread-style cookies, so they will be crumbly. You should have 22-26 cookies. That's it! You're done! Enjoy your tangy lemon cookies and daydream about Mars. Images of M'gann are screenshots from Young Justice. Others are photos taken by me.